Collingwood, as Nelson’s second-in-command, led one of the two columns that struck the line of the Franco-Spanish Combined Fleet shortly after midday on 21 October 1805. The aim was to engage and defeat the enemy rear while Nelson went for the enemy fleet flagship and his squadron occupied the attention of the Combined Fleet’s van and centre. Collingwood’s flagship was the first to be engaged as HMS Royal Sovereign, with a new copper bottom, was fast and pulled ahead of the ships following. She aimed to cut in between the Spanish Santa Anna, flagship of the rearward enemy squadron, and the French Fougeux. The latter ships tried to shut Royal Sovereign out but Collingwood was not to be denied and ordered Royal Sovereign to sail straight at Fougueux’sbowsprit forcing the latter to turn to starboard, and allowing a raking shot along the full length of the Spanish flagship before loosing a broadside against the Frenchman to starboard. Great damage was done to both ships and their crews but both continued to fight. Four more enemy warships joined in before being diverted by other threats as the rest of the fleet came up. Royal Sovereign’s yardarms became entangled with those of theSanta Anna as the great three deckers poured shot into each other. Through the inferno Collingwood remained apparently unperturbed, pacing up and down, eating an apple, even as the flagship’s master was killed by a cannon ball beside him and Collingwood suffered very bad bruising in the leg from a flying splinter of wood as well as being hurt in the back by a ball passing by literally too close for comfort. In a world of inaccurate smooth bore weapons injury or death was a matter of chance. The odds favoured the British second-in-command that day, not the fleet commander. Although the Spanish in Santa Anna fought well that day killing forty seven men of Royal Sovereign’s complement and wounding twice as many, the Spanish ship lost almost as many men again as superior British rates of fire told their usual terrible story. As her fire slackened it looked as if Santa Anna had surrendered but she made a last attempt to get away moving ahead of Royal Sovereign and raking her before being re-engaged by the British ship’s starboard guns. Then two of Santa Anna’s weakened masts fell and she finally struck her colours at 2.20. As she did so Royal Sovereign lost her mainmast also. Now a boat arrived from HMS Victory. Lieutenant Alexander Hills came on board to inform the second-in-command that Nelson had been wounded. Collingwood sensed from Hills’ expression that the situation was very serious. He now ordered the frigate Euryalus to take Royal Sovereign in tow and the frigate’s distinguished Captain Blackwood was sent on board Santa Anna to bring its admiral, Alava, on board. The latter had been seriously wounded in the head and sent his flag captain with his sword. Collingwood sent the captain back to look after his admiral. As the ships that had originally led the enemy fleet came round to attempt to rescue the centre and rear, Collingwood drove them away, engaging them under tow until enemy fire broke the cable, while ordering the aftermost ships in his squadron to see them off. Blackwood now closed Victoryto hear the news of Nelson’s death. He then took Captain Hardy to meet Collingwood and surrender Nelson’s command to him. 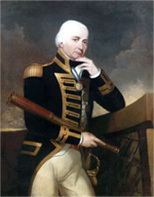 Hardy told Collingwood that Nelson had ordered the fleet and its captures to go to anchor but Collingwood disagreed. Instead, shifting his flag toEuryalus which again took Royal Sovereign in tow, he ordered his ships to make towards Gibraltar, disabled ships to be towed. Now Collingwood’s luck finally ran out. Worsening weather caused Euryalus and Royal Sovereign to collide and Collingwood belatedly ordered the crippled fleet to anchor. The storm struck in full force on the 22nd and lasted on and off for four days. In the terrible conditions Collingwood set about destroying the prizes, some of which also sank, made their escape or were recaptured (among them the Santa Anna), leaving only four out of the original seventeen captured ships in British hands. Collingwood’s decision-making caused controversy both at the time and since. Nevertheless Collingwood remained sufficiently trusted by the Admiralty and the British Government as a whole to remain to be worked to death over the next four and a half years as C-in-C of the Mediterranean Fleet. His central involvement in the overall destruction of the Franco-Spanish fleet at Trafalgar overshadowed his losses in the storm and he emerged from the battle as Baron Collingwood, its other, but still living hero. Eric Grove became a civilian lecturer at the Royal Naval College, Dartmouth, in 1971 and left at the end of 1984 as Deputy Head of Strategic Studies. He later taught at the Royal Naval College, Greenwich. From 1993-2005 he was at the University of Hull becoming Reader in Politics and International Studies and Director of the Centre for Security Studies. In 2005 Dr Grove moved to the University of Salford where he is now Professor of Naval History. A prolific author who frequently appears on radio and television, he is a Vice President of the Society for Nautical Research, a Member of Council of the Royal Navy Records Society and a Fellow of the Royal Historical Society.